Hosting a sleepover can be a lot of fun. But for first-time kids and parents, it can also be a daunting experience if you're not prepared. So to help bring more "yay" and less "no way" to your child's next sleepover, here's our 7 Secrets to a Successful Sleepover. 1. Are your kids ready for it? Are you? We're often asked what age is the best age for a child to have their first sleepover. Our answer; it depends on your child. Most kids at age 7 or 8 are ready to have a sleepover with their friends, but it's not something that should be forced or rushed into. If your child is thinking of games to play, things to do and who to invite that's a pretty good sign. And if they've had a night away at a friends or cousins it probably means they are ready for the big leagues of a group sleepover. For kids under 7, we recommend our SlumberUnder which is specifically designed for kids who aren't yet ready to stay the night but don't want to miss out on any of the fun. Think of the SlumberUnder as an "almost sleepover" where the kids arrive in their pajamas in the afternoon, had some fun, watch a movie from the comfort of the WonderTents and then leave around 8 or 9pm. Another idea is to have an opt-out where any of the kids can call their parents to be picked up at bedtime. It doesn't happen often, but it's a nice comfort to have. Of course, the other question to ask is, "Are YOU ready for it?" You, Mom. You, Dad. Are you ready to have a group of kids in your home for an overnight stay? If the idea is going to keep you up at night then maybe look at other group activities until you're comfortable with the thought. Of course, we can offer helpful hints and activities to make the night less of a chore and more of a roaring success. 2. Have your child lend a hand in the planning. Remember it is their special night so make sure they lead the way in planning the event. Let them feel empowered by deciding who to invite and what activities to do. It's great to help them by offering suggestions of what might be fun but follow their lead. No matter how cool and hip you are, they know their friends best and will know what activities they will enjoy and what ones they won't. Guide them and keep suggestions in your comfort zone but always keep the focus on fun. 3. Keep the numbers comfortable. This is especially true for hosting your first sleepover. We suggest your child and four of their friends is a good number for a first outing. This makes you feel confident you'll have things under control (after all, no-one likes herding cats) and it won't have your child feeling too overwhelmed with having to "entertain" a large group. We've also helped parents host Sleep Overs for groups as large as 20! Large groups might feel daunting but the truth is they often end up entertaining themselves which frees you up. Another good tip is to think about the personality of the kids you're inviting. Make sure there's a good balance of outgoing and friendly kids to help keep things moving and inclusive. Also if the group is pretty tightknit already, now may not be the best time to introduce a new friend to the mix. 4. Keep the parents in the loop. One recommendation we make is to have parents leave their details on a Contact Sheet that's kept on the fridge. That way if you, or their child, need to call them their number is super handy. Sometimes just visually seeing that Mom/Dad is just a call away can settle any nerves. 5. Feed them well but hide the sugar. Part of the fun of a sleepover is sharing a meal or some treats together. But keep it all within reason. Have a fun food activity like making your own pizza or creating your own sundae planned for early in the night or before the movie. And give the kids a chance to burn off any excess energy. Try holding off on any sugary treats the closer you get to bedtime. And again be aware of any food allergies or foods that might cause an already nervous tummy to get even more upset. The last thing you want is a "Clean up in aisle five!" While it's great to have a plan of activities to keep the kids entertained, remember to keep the plan flexible. Some activities will keep their attention longer than others, and some might just not come off as planned. That's ok. Just go with the flow. The most important thing is to make sure the kids are having fun. 7. Sleep will come. Just not when you plan it. Part of the joy of a sleepover is the bonding and chit-chat that happens at bedtime. While we recommend you have a defined "lights out" time, plan it to be for an hour before you really expect them to go to sleep. And then plan for it to go on after that. It's ok to check in on them and give them a gentle but final "Goodnight" when its time to sleep. Other things to keep in mind is to have a "codeword" with your child so they can let you know if things are getting out of hand or someone needs help. Something simple like, "What time is it?" is great way for your child to let you know to check in on them or help out without making it a big deal. Also, keep a hall light on or create a path to the bathroom with night lights so you don't have to worry about things that will go bump in the night. 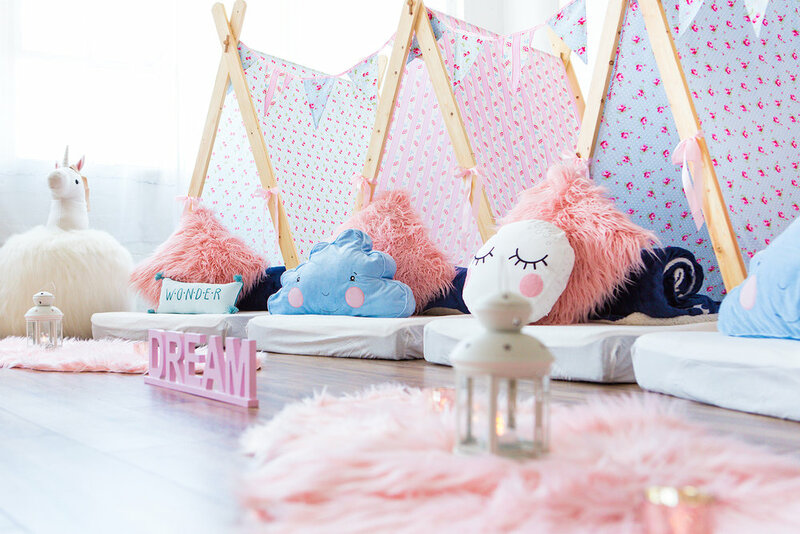 We have designed each of our SleepOver setups to include individual fairy lights and individual lanterns so if a child needs a little light to feel safe they can feel in control of it. This past Friday I joined Jessica and the team at KTLA5 Morning News to talk all things WonderTent Parties. Having never done LIVE TV before, let alone having to wake up at 4:30am to do so (How do they do it?!?!) I was a little - ok a lot - nervous but Jess and the team made me feel totally at ease. 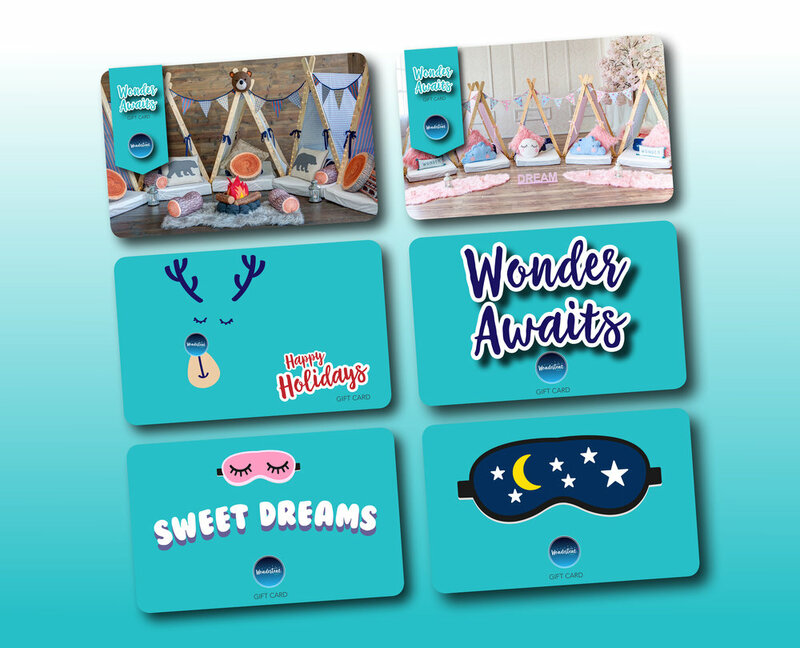 It was a joy to showcase some of our latest offerings and bring our unicorn inspired SleepOver theme Unitopia to the studio. And how cute are our little models! It’s also a pleasure to talk about our Good Intent initiative that donates a portion of the proceeds from every WonderTent Parties experience to Kidsave, a charity that helps connect older foster youth with adult mentors and forever families. As many of you know, it was through Kidsave that we met Celia, now our daughter, who joined our family at 13 and inspired the creation of WonderTent Parties. Thanks to team at KTLA5 for supporting local Los Angeles businesses and inviting me on to share my story. 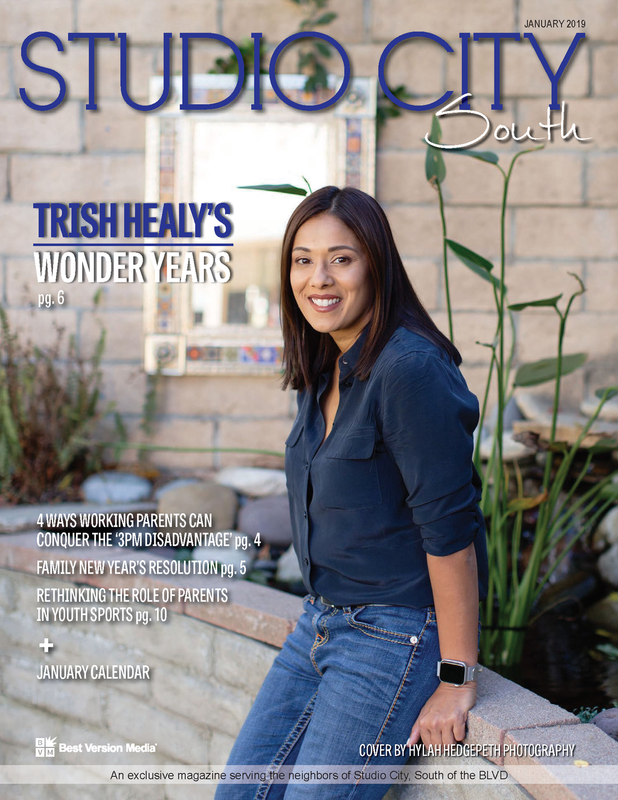 WonderTent Parties Founder & Event Stylist Trish Healy joined us live with details on her company and how they’re taking sleepovers and glamping to a whole new level. 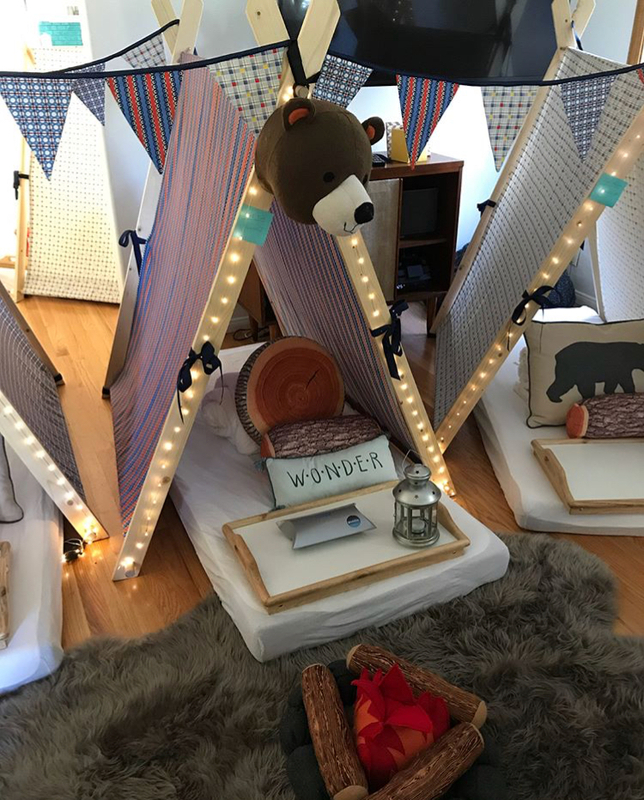 WonderTent Parties provides 5-star at home Sleepover and Glamping Experiences for both kids and adults. They deliver everything you need, set up & style, and collect the next day. Each child enjoys their own private “WonderTent” with all the trimmings. Special experience themes are designed for both girls and boys of all ages. And for adults they offer glamorous glamping options from dining experiences, to chill zones, to wine tasting and more. 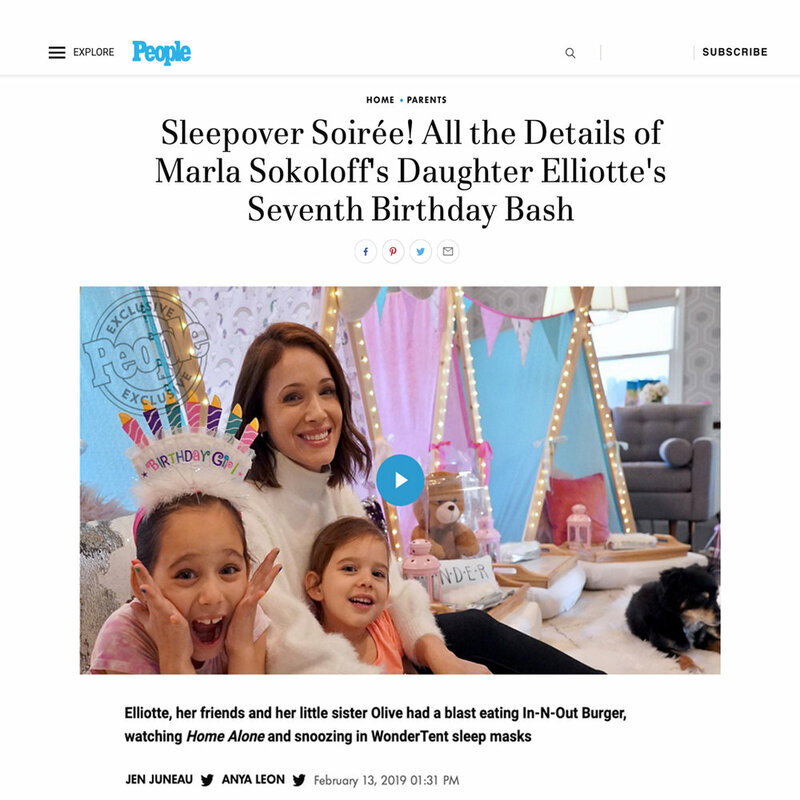 Imagine my surprise when I received an excited text from a dear friend that People Magazine had covered a recent SleepOver we did for the amazing Marla Sokoloff and her gorgeous daughter, Elliotte, to celebrate her 7th birthday. 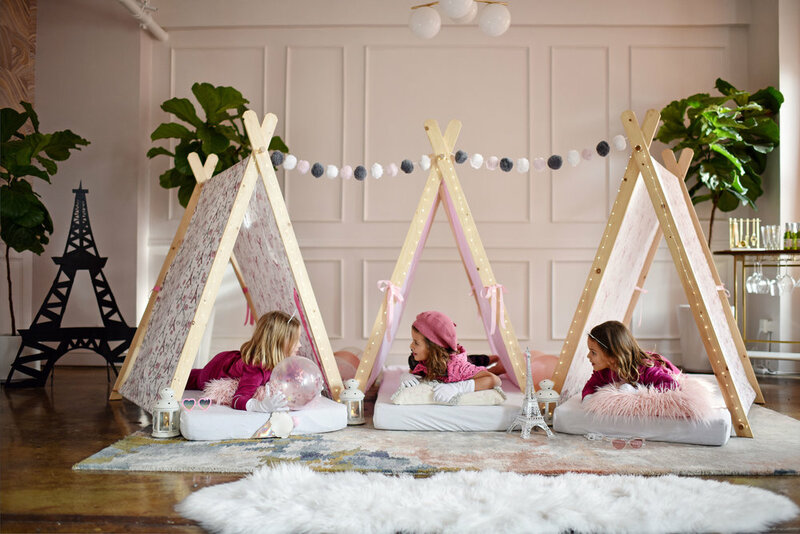 A squeal may have emitted from my lips when I read the article and saw the gorgeous photos of Marla and her daughters, Elliotte and Olive, enjoying our Unicorn inspired theme, Unitopia, and our SleepOver set up. Hearing that our clients are loving our experiences, whether our signature SleepOver or glamorous GlampOut, makes everything we do worthwhile. As anyone who has started their own business knows the road isn’t easy and it requires you to give your all 24/7. So when you get recognized like this, it gives you a boost that what you are doing matters and you are on the right track. And yes, a little happy dance may have been done. Celebrate New Years with this Kid Friendly Countdown from Netflix. Quick everyone, it’s almost 7:00pm! If you’re planning on celebrating New Year’s Eve with little ones, Netflix has the answer to wanting to give the kids a new years party without the grumpy post midnight tantrums. For the firth year running, Netflix has just published a slew of videos that offer a "fake" countdown clock to midnight. The genius idea here is that the videos can be played at any time. So your kids can join in on the New Year's Eve festivities and still get to bed on time. This year’s videos include characters from Alexa and Katie, Prince of Peoria, Pinky Malinky, Motown Magic, Skylander Academy, Super Monsters, Boss Baby, and our fave, Fuller House. Just search for "New Year’s Eve Countdown” or “Countdown” on Netflix to locate these videos or get quick access via the "Kids" row on the Netflix menu. And you don’t have to wait. Each of the countdowns are available to stream from today, giving you a chance to prescreen them and decide which one to watch on New Year’s Eve. The 12 Greatest Christmas Movies... ever! We’ve got a tradition in our family that every Friday night in December is Christmas Movie Night. We each take a turn picking one of our Christmas faves to watch while sipping on hot chocolate and snacking on Christmas Cookies. Of course with so many great Christmas movies to choose from how do you settle on just one? Well to make it a little easier, here’s our list of the 12 Greatest Christmas Movies ever… or at least until next Christmas when we are sure to discover a few more faves. 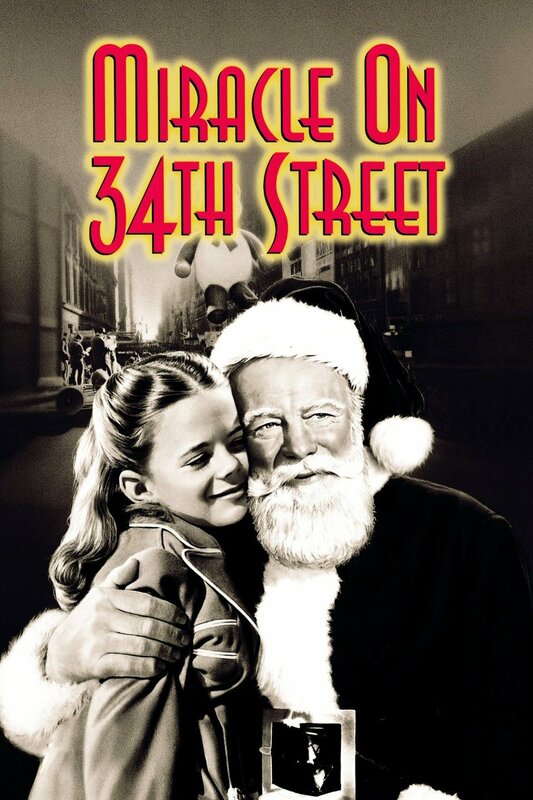 An absolute must view, this classic will warm your heart and fill you with Christmas cheer. I recommend the original, but my daughter loves the remake. Either way you can’t lose. Who would have thought the idea of two bumbling burglars terrorizing a child would be full of Christmas cheer? This laugh out loud (and totally quotable) movie is one of my daughter’s favorites. And for good reason. So grab a slice of pizza or serve yourself a supersized Sundae and laugh til your sides are sore. Kids, big and small, will love it. For cotton headed ninny muggins everywhere. Elf is such a delightful Christmas movie. We may have been late to the Elf party, only discovering this gem a few years back thanks to my Goddaughter, but since then it’s become a Christmas staple. Whilst the classic cartoon is bound to be shown on TV at least once this holiday season, it’s this live action flick that does it for us. Your heart will grow three sizes too! This has a soft spot for us because last year we helped Ella enjoy her first ever Slumber Under with a Polar Express themed party. Her reaction was priceless. And its that sense of wonder that this movies is all about. Get lost in the magic of it all and just… believe. Ok so this is my pick. And while all story lines may not be totally family friendly, for the teens and adults this one will bring laughs and maybe a tear or two. Ok, anyone who knows me will tell you I’m a sucker for a soppy rom-com. And in some Christmas spirit and how can you pass up The Holiday? It’s the feel good movie you need in your life. So curl up on the couch, enjoy a Christmas goodie or two, and enjoy. Is it really Christmas if you don’t at least catch a fleeting glimpse of A Charlie Brown Christmas? It might feel ubiquitous but it’s a classic for a reason. And hey, Snoopy rocks so yeah… watch it. Christmas film or Halloween film? 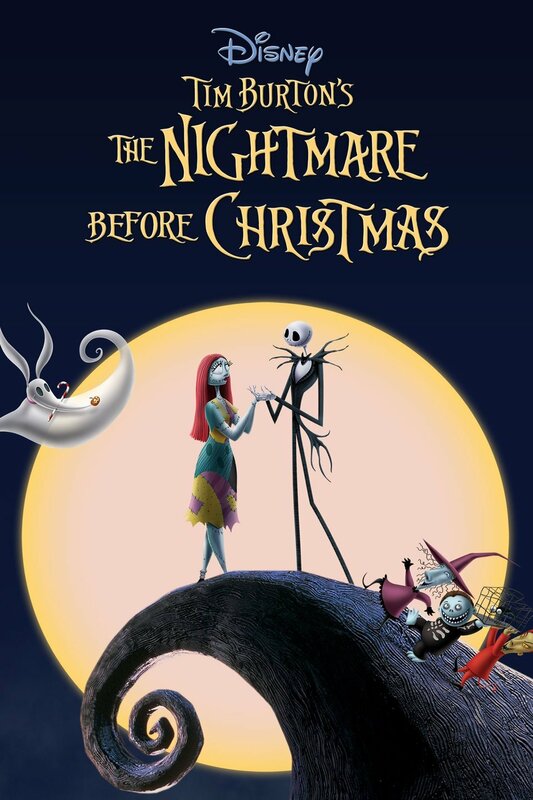 Either way, this twisted tale from the mind of Tim Burton will appeal to your “too cool for Christmas movies” teens. Before long you’ll all be cheering for Jack Skellington to take over Christmas. While the stop-motion effects might feel a little dated (and that’s still part of the charm) the film’s off-beat nature is a refreshing addition to the Christmas roster, packing charm with just the right amount of creepy to make this a must watch. So it may not totally be a Christmas movie, but my daughter won’t pass up a chance to watch Mean Girls, and the Winter Talent Show rendition of Jingle Bell Rock will have you wanting to join in and recreate the routine with the family… or so I have heard. 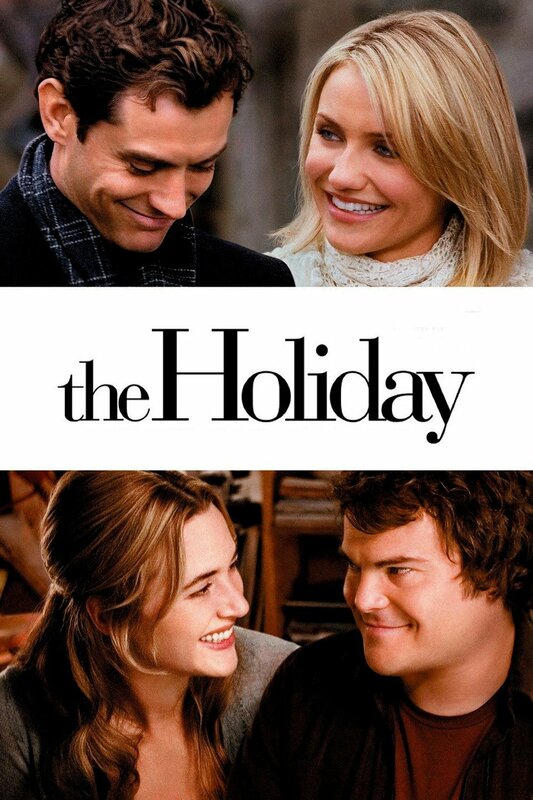 If you’re in need of some silly humor and holiday fun, this is the movie. And it’s a fun reminder that try as hard as we do, the best Christmas plans will go awry. So go with it. Besides who hasn’t watched this movie and not been inspired to totally Griswold the house with a million blinking lights? To create an unforgettable Thanksgiving there are a few things that are must have. Great food. Great company. And Great music. While we can't help with the Turkey, we've got the music covered. As you'll see from our "Feast On This" playlist we've got over two and a half hours of songs inspired by family, being thankful and of course food. They'll be songs to bring a smile to your face and songs to raise a toast to. Songs to sing along with and songs to make you happy to be home. So whether you're celebrating with family or friends, this set of hearty tunes will satisfy all your Thanksgiving cravings. With Halloween just around the corner and everyone picking out their costumes, we thought it was time to unleash our Thrilling Halloween Playlist. Jam-packed with spooky tunes and killer grooves this collection of songs will bring any party to life. And best of all it's suitable for ghouls of all ages. From Halloween classics like "Monster Mash" and "Purple People Eater" through to the quintessential Halloween track, "Thriller" there's something to keep even the most stubborn of ghosts and goblins grooving. And just so your kids don't think these are all songs taken from the crypt, there's modern favorites like "Heathens" by Twenty One Pilots and Fifth Harmony's "I'm In Love With A Monster." So to get your party going, just load it up and remember to play it loud enough it wakes up the dead. And of course, for the perfect Halloween party why not throw a spooky Sleep Over with our WonderTents and some deliciously spooky treats. We loved sharing our story with ABC7's Eye on LA tonight and are proud to be included on their list of "Must-Do Experiences in LA." 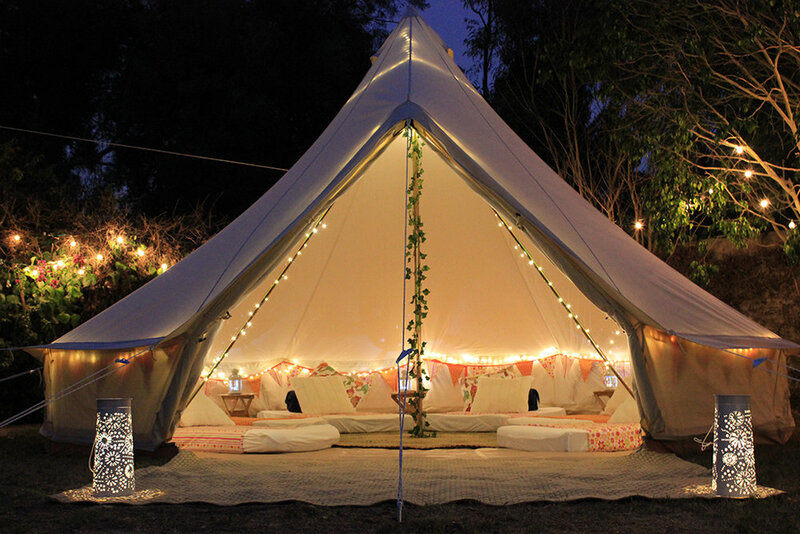 At WonderTent Parties we always strive to bring magical, memory-making sleepover and glamping experiences to you. All of our experiences, from the ultimate slumber party with our SleepOver and SlumberUnder parties to our next level glamping with our GlampOut or GlampIn experiences, give you, your kids and your family memories they will cherish forever. See how we bring the wonder below. Turn Spring Break Into A Stay-cation To Remember. 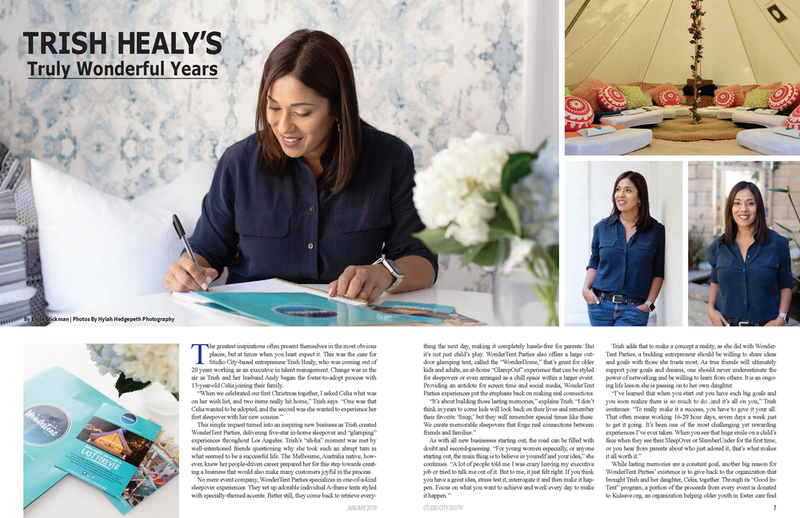 Beyond excited to be featured today in our of fave online communities, LA Mom Magazine. Check out this informative article about how WonderTent Parties can be a fun Spring Break experience for your kids and the family. Click the image below to read the article in full. With Valentine's Day here hopefully you have sorted out the card, the flowers, the dinner, and a little gift. What you may not have thought of though is music to help set the mood. Fear not, we've got you covered with a specially curated playlist to get the heart pumping. So press play and let love rule. With Valentine's Day fast approaching it often feels like there's a big push to dial up the romance. We buy flowers, special gifts, write heartfelt cards, maybe hit one of the city's top restaurants and for the night we are "in love" and more than happy to celebrate it. But then the 15th rolls round and we're back to our lives of being parents. The flower and cards are quickly replaced by homework and school drop offs and the reality of being Mom or Dad. But it's important for our own wellbeing, the wellbeing of our relationship, and the example we set our kids, that declarations of love aren't just restricted to a 24 hour period. 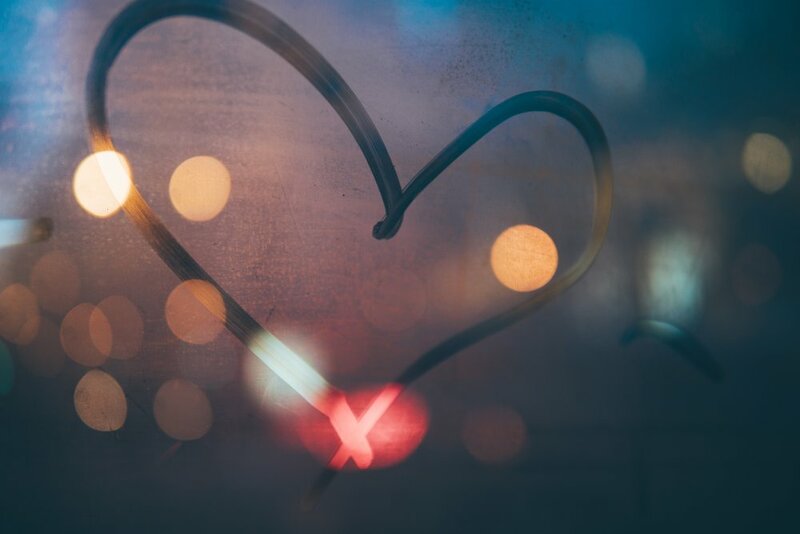 So here to help extend the romance beyond Valentines Day are 7 little things you can do to make sure the spark that set your heart aflame keeps burning brightly. Why save how you feel about your SO for just one or two cards a year? Surprise the one you love with the unexpected Post-It that expresses how you feel about them. It can be naughty, nice, lustful or loveful, just write it down. Let them know what they mean to you, or how you miss them. Then stick them in unexpected places like their journal, on the driver's seat, on their coffee mug, on the bathroom mirror. Just don't kill the joy by asking them if they got it. They may not mention it (for they might want to surprise you by lifting their romance game too.) Just do it to express how you feel without the need for validation or reward. Of course, you don't need to restrict it to Post-Its. Scrawl a message on the mirror, trace a message in the steam of the shower, or send them an unexpected text. Sure your kids may scream "Gross" or decry how embarrassing you are, but showing affection freely and often will help you both feel more connected. From holding hands while you walk to kissing on a crowded street to just cuddling on the couch while the family watches TV. It might sound simple but so often we back off from being a couple because we're assuming our Mom or Dad roles. But showing affection towards each other models for our kids what a healthy, loving relationship looks like, and removes any question the kids might have about the safety and stability of your relationship. Unplug the phone, tablet, and computer, turn them off and put them away. Replace FOMO with FOMU - Fear of Missing Us - and spend an hour staring into each other's eyes rather than staring at a screen. Take the time to talk about stuff that matters to the two of you (keep convos about the kids to a minimum.) Share how your day was, ask about theirs and really listen to the answers. You'll be surprised just how intimate it can be to hear and be heard. Also feeling this close you never know where it might lead. That email or cat video that seemed so pressing an hour ago is now the last thing on your mind. We've all heard about the importance of "Date Night" but how many of us actually adhere to a weekly or monthly night out just for us. We tried it and we weren't overly successful. Our plan was to dine at all the Top Chef restaurants in LA over the course of a year, one a month. We got as far as 3 in the year. Now 3 is better than none but it showed us how easily we let "life" get in the way of "love". We also let ourselves off the hook by letting a trip the movies or hanging with friends count as our date night. But ultimately we knew we were robbing ourselves of "us time" so we refocused and now commit to a date night a month come hell or high water. Date Night should be treated with the same kind of commitment as our kids' soccer games or dental appointments. It shouldn't be allowed to be replaced by something else. And if, if, if we have to reschedule do it within 7 days. And take turns planning the date so all the pressure isn't on them or you to make it work. Have fun with it. Do a class together. Revisit your favorite restaurant. See that movie. Go to that exhibition. And get dressed up for the occasion, this will help you switch out of parent mode and into partner mode. Whether you decide to carve our weekly or monthly date nights stick to it. It will be easy to swap it out with more important stuff but nothing is as important as spending time together. There's nothing like the thought of getting away for a few days (ok, even a few hours) to make us feel blissful. So start planning your dream getaway together. Scour some websites, gather some brochures and start thinking about what it will be like to just get away from it all. It doesn't have to be that lofty trip to the Maldives (though that does sound nice). Even planning a night at a local hotel where you can gorge on room service and each other can hit the spot. Like they say, the destination is important but even more so is the journey, and the time you spend together making plans will go a long way towards making them come true. We all love getting a compliment. So don't be stingy when it comes to giving them either. Every day give your SO a compliment that makes them smile, blush, or want to race home. Let them know you're grateful for what they do and how good they are at it. Let them know they are the best, the be all and end all, the one. Compliment the way they look, the way they make you feel, and the things they do for you and the family. And be willing to take a compliment too. There's nothing worse than brushing off a compliment so take it in and let your heart swell when you hear it. We all know what it feels like to be in a rut. We also know the only way out is to do something new or unexpected. Now I'm not suggesting you go skydiving - unless that's something you'd like to try - but doing something new, thrilling and exciting is just the thing to spring you both back to the loving couple you are. A new activity brings you closer as you both have to rely on the other to navigate your way or share the experience. It can be a great way to connect like you used to when everything you did together was new and exciting. 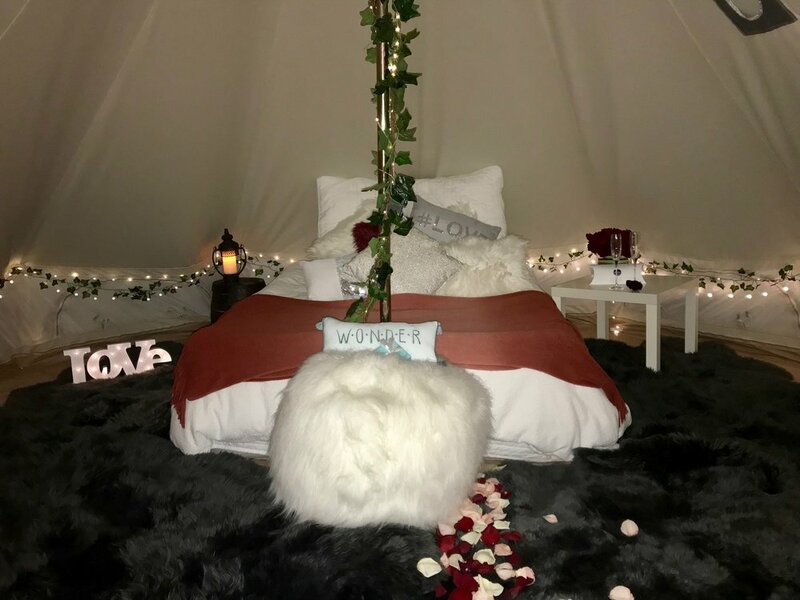 Becuase we can all do with a little help in the romance department, we've created this exquisite and intimate Romantic Nights GlampOut. Spend the night with your loved one under the WonderDome and dedicate time to the two of you. These are just 7 ways you can rekindle that romance in your relationship. Of course, we hope it leads to discovering many other ways the two of you can connect and grow as a couple.